I have been looking for a good chocolate cake recipe for a while, so this was a good excuse to test out a few different recipes in advance of the official cake baking. The first one I made was moist and had a good chocolate flavour but it reminded me too much of a packet mix chocolate cake - and if I'm going to spend time measuring and mixing then I want it to taste like I've made it from scratch. However, the chocolate icing from that recipe was fantastic - definitely a recipe to keep and use again (see below). So like Goldilocks I moved on to recipe number two, an almond-meal based cake which was quite dense. Because of the height of the KitKats I would need to layer two cakes together and I thought that two layers of this particular cake would be a bit too rich (even for a chocolate lover). I needed something that was light but still had a big chocolate flavour. Then I came across a recipe for David Lebovitz's Devil's Food Cake. I had never made a devil's food cake before so I wasn't sure how it would go, but when I made this one I was really happy with the way it turned out and knew that this would be my new favourite chocolate cake recipe. Goldilocks had found the one that was just right. For the KitKat cake, I made two separate cakes as per the recipe. I used water instead of the coffee as I'm not a fan of coffee flavour. I used chocolate icing (see below for recipe) for the outside of the cake (rather than the ganache from David Lebovitz's recipe). 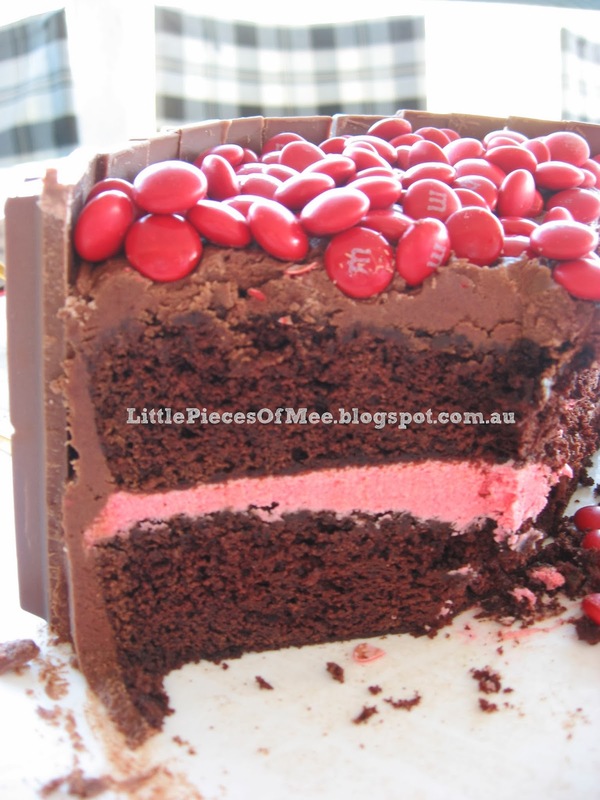 I also made a raspberry buttercream icing (see below for recipe) to put between the two layers of chocolate cake, just to offset some of the chocolate and also incorporate a bit more red (well, pink actually) inside the cake. It tasted delicious and has a natural pink colour without needing food colouring. If using frozen raspberries, allow them to defrost (either at room temperature or in the microwave) before pureeing. Place butter in a mixing bowl and beat with an electric mixer on high until smooth and fluffy. Gradually add icing sugar, beating until combined. Add raspberry puree and beat until combined. You want your icing to be stiff enough to hold it's shape but soft enough to spoon or pipe. Once the raspberry buttercream was spread on the first layer, I added the second layer of cake. I put the cake in the fridge at this point so that the raspberry icing could harden a bit while I made the chocolate icing. Melt the butter in the microwave in a large microwave-safe bowl. Mix in the cocoa. Add in the icing sugar a cup at a time, alternating with half the milk. Add in the vanilla and beat on medium speed for 5 minutes. If the frosting is too thick, add a little more milk. I then iced the whole cake with the chocolate icing and then it was ready to decorate! I had bought 4 of the large family packs of KitKats which have 11 bars in each. I used 3 whole packs plus two extra bars to go around the cake. I started by breaking the KitKats by hand but quickly discovered that I wasn't getting a clean break, so I switched to using a knife to cut between the bars - this was much better. When I got to the end, I couldn't quite fit a whole KitKat in the remaining space, so I trimmed the edges of the last bar to fit snugly. I could have spread the other bars out a bit more instead, but I wanted the solid look of the bars right next to each other. Once the Kit Kats were all in place, I tied a red ribbon around the middle - this both covers the indent in the middle of the KitKats and keeps them all secure. Then the last job was to sprinkle the M&Ms on top. I found single colour M&Ms at a confectionery store in Brisbane (they had lots of different colours to choose from, including silver and white) and used about 350g. I chose red as this is my sister-in-law's favourite colour, but you could also use the multi-colour packs from the supermarket, or occasionally you can find other colour combinations at supermarkets around Christmas and Easter. I was very happy with the end result and I think my sister-in-law liked it too, which is the most important thing! It was very rich though so a small slice was more than enough.